Lots of happenings these days in the world of sports. First and foremost, the Olympics are currently under way in Vancouver and if you solely watched on NBC you might think they are only occurring in prime time. The geniuses at NBC (same Einsteins who botched the whole Conan/Leno fiasco) have decided that you should only follow the Olympics at night, despite the fact that most of the events occur during the day. This type of tape-delay programming could fly in previous Olympics when the world was not immersed in the Facebooking and Twitterdom of society. With so much real-time exposure to news in 2010, it makes absolutely no sense to air flagship events like Downhill Skiing and Snowboard Cross hours after they take place. I understand that NBC can get a larger audience at night and that's all well and good. Why not air the events twice, live during the day and a recap at night. Even when the events do air at night they are cut down and condensed. 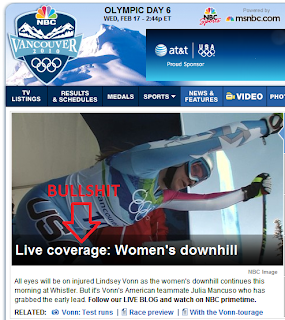 We only saw 5 or 6 runs of the Men's Downhill for example. The 500 M Speed Skating final (the 100 yard dash of the winter games) was delayed for an hour due to ice issues so instead of NBC showing the event live as planned, they instead pushed it back to late night (after the local news) and showed a feel-good profile of polar bears during the live event. I was able to watch the event online through a bootleg stream from the BBC, but most everyone else never saw the event. Other networks like CTV in Canada and the BBC are showing these events live. Aren't we supposed to be the pioneers of television broadcasting? NBC has really turned into a dilapidated shell of a television network. I'm wondering if Fox would have done a better job of covering these Olympics. On a positive note, the official Vancouver Olympic website does an excellent job of providing real-time scoring updates and comprehensive Olympic coverage. Us American Olympic aficionados are forced to watch live scoring and statistics rather than live video. At least Vancouver2010.com makes the experience somewhat pleasant. On to Tiger Woods and his well-orchestrated 13-minute apology that he gave today in Florida. He seemed pretty robotic up there to me and somewhat sincere but all-in-all I don't really care about his private life. I just want to see him teeing it up in a few months at Augusta. Tiger claims that he "may" come back and play golf in 2010 but he was very vague in discussing his golfing future. If he misses the Masters I will be disappointed. His transgressions are his own business and affect his family directly. His absence from the Masters and other majors in 2010 affects my enjoyment of those events and that is the only real personal connection I have with the Tiger Woods saga. No matter what you think of him as a person, he is still the greatest golfer of all-time and intriguing to watch. 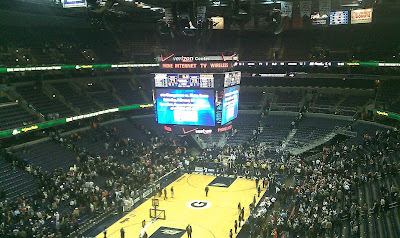 Finally in keeping with the sports theme of this post, I had the pleasure of attending the Syracuse / Georgetown basketball game last night at Verizon Center. The Orange are playing out of their mind this season and have a realistic chance at holding down a #1 season in the NCAA Tournament next month. It's been a wild ride and I had high hopes going into the game last night. Watching with some of my Syraucse buddies (and my brother), the Cuse charged to a 23-point lead at one time only to have the Hoyas storm back to trail by only 1 point late in the game. Syracuse managed to survive in the end and won by four points (they ended up leading the entire game). We all went to the Greene Turtle to celebrate with other Orange fans. At 25-2, this is the best team I've ever seen at Syracuse. I'm hoping these close games will help us develop some resolve come tournament time.